Last week Google's Open Source Team hosted the London Open Source Jam 8 (the 9th in the series - we started at zero, of course). This event was started as an experiment back in September 2006 by a bunch of volunteers in the (then fairly new) London Google engineering office to try to better connect with the local Open Source community. Since then we've been running them roughly every 2-3 months. It's free and open for anyone to sign-up to on a first-come-first-served basis. It's on a weekday in the evening, so you don't need to take time off work or away from your weekend family/code-hacking time to attend. We'll even feed and beer you. The evening is structured around a sequence of informal lightning talks (5 minutes maximum). Anyone can give a talk (though please at least pretend to be roughly on topic). Some people come prepared with slides and demos and stuff. Others make it up as they go. If you've got something you think will be of interest, it's a good place to talk about it. You can expect the talks to be technical - it's a developer event, arranged by developers, for developers. If you want to work on some code, bring your laptop along. 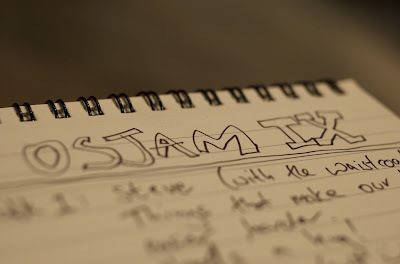 Read all about it on the OSJam page and check out photos from the most recent Jam. Steven Goodwin - Practical development tips. Principle of least surprise, write for maintainability, think about debugging, etc. Nicolas Roard - Literate Programming (PDF). Introduction to the 80's paradigm and how it applies to modern day development. Upayavira - A potential Open Source project to manage post-build incremental deployment tasks such cluster management, database upgrades, etc. Alastair Maw - Building web-apps with Apache Wicket: how the API was designed for discoverability. Tim Emiola - Typing. Not that kind of typing: actual keyboard typing skills. How being a faster typer can help your productivity. Nigel Runnels-Moss - The paradox of productivity - an investigation into measurements and metrics for knowledge workers. Douglas Squirrel - Spent 5 minutes listing and explaining every tool his development team uses to improve productivity. Ade Oshineye - How a simple script and a culture of continuous feedback can help new team members get up to speed. Ivan Moore - Build-o-matic. An Open Source distributed continuous integration server, with nice features like showing pictures of who checked in and binary searching to quickly determine which change broke a build.